Cyndibands, the ultimate gentle elastic hair tie, presents the Match Your Hair Color Collection, which includes solid color elastics in monochromatic packs of 6 ponytail holders. Whether you color your hair or not, when you put it up in a 'do with a traditional hair tie, it just feels like something is missing. A ponytail or other up do should look and feel fabulous, shouldn't it? Not like some afterthought. That's where Cyndibands new selection of Match Your Hair Color Cyndibands comes in, solid color hair ties in neutral shades to blend in with your hair. Other brands of hair ties either come in very basic colors like black or brown or are offered in a rainbow assortment. If you wanted them to blend in with your natural (or dyed) hair color, there were not a lot of options until now. Cyndibands has been making soft, stylish, and gentle hair ties since 2010 and has now introduced a special range of hair ties that Match Your Hair Color. Like all other Cyndibands, the Match Your Hair Color collection is made from a gentle and stylish elastic ribbon with non-fraying ends. Unlike traditional hair ties, they act as an accessory for the hair and when you feel like letting your hair down, you'll find they make for a sweet accessory for your wrists. 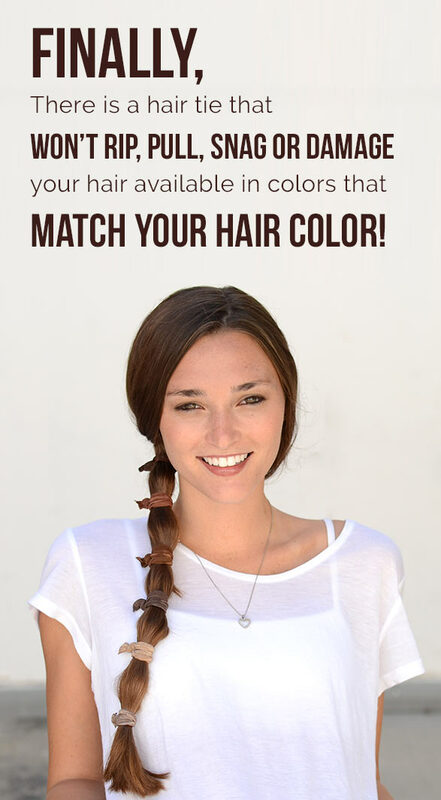 In the Match Your Hair Color collection, colors abound that aim to blend with your unique shade. 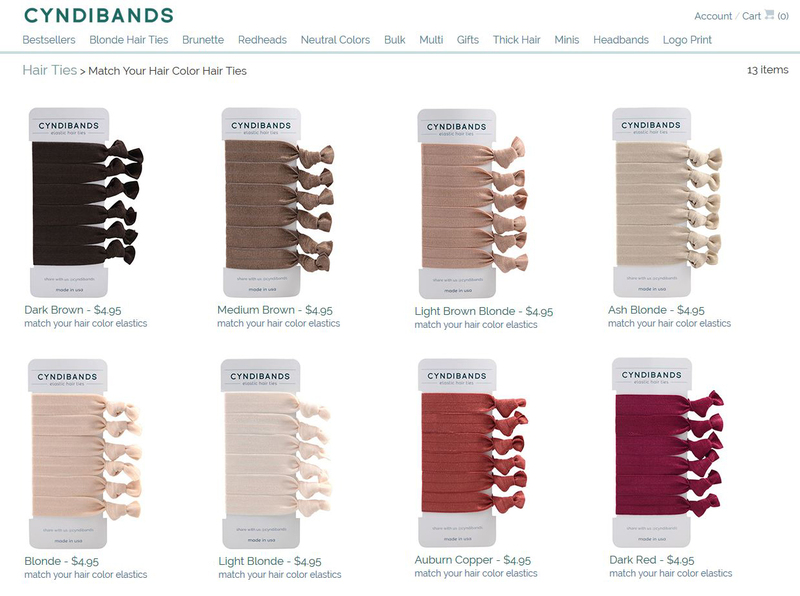 Currently, the collection offers Cyndibands in 14 colors. Black - What can we say about black? The single most popular hair tie color. EVER. But where do they all go? Dark Brown - Our darkest brown shade that we also describe as Espresso or Coffee Brown (coffee without any cream or almond milk). Chocolate Brown - Classic chocolate color brown shade for brunettes. Medium Light Brown - We call this color Medium Light Brown but it can also be described as Light Cool Brown or Medium Ash Brown. Dark Golden Blonde - You may be surprised to learn that this Dark Golden Blonde color is one of our most versatile colors because it blends in with many different shades of hair. This color works for light hair ranging from light to medium and dark blondes as well as brunettes with light to medium brown hair. This color could also be called Lightest Brown. Light Brown Blonde - This is our lightest brown color that could also be called Sandy Blonde or Medium Champagne. Medium Blonde - A versatile color that is slightly darker and richer in color than our Beige Blonde. Beige Blonde - This classic beige blonde color could also be called Honey Blonde because of its warm tones and some may even call it a light medium blonde. Ash Blonde - This is our most neutral blonde color that we've noticed blends well with natural light blonde hair. Light Blonde - This is our lightest blonde color that can blend in with platinum blonde hair. Auburn Copper - We know natural redheads do not have it easy when finding hair ties to match their tresses, but we love this rich color and it works well with dark auburn and copper color hair. Dark Red - We admit that this scarlet red color blends best with dyed red hair as opposed to natural red hair, but our collection wouldn't be complete without red hair ties. Dark Gray - Dark Gray AKA Pantone 430C is a neutral gray that is popular regardless of hair color. Light Silver Gray - This light silver is one of our most popular colors and is perfect for natural gray hair, the gray hair trend, and for blondes who want some contrast. Cyndibands are a must-have hair accessory for women everywhere because the soft elastic material doesn't snag and cause damage to your hair, even if you color it. Traditional bands can lead to breakage, but Cyndibands hair ties are gentle on your dyed hair so you can tie it up without ruining the quality and health of your hair. They look cute on everyone no matter what hair type you have so stock up on Match Your Hair Color Cyndibands today or choose from the many other amazing collections.